What Is the Climate on Neptune? A gas giant and the furthest major planet from the sun, Neptune has been found to have very active weather patterns. Its distance from the sun means the atmospheric temperatures can be some of the lowest in the solar system, down to –218 degrees Celsius. The atmosphere surrounds a liquid mantle of water, methane and ammonia. Heat from the mantle mixing with the cold atmosphere drives the winds to the highest known speeds of any planet. Hydrogen is the dominant gas in Neptune’s atmosphere, with smaller amounts of helium, methane and other hydrocarbons. Its strong gravity lets it retain light gases that escape from smaller planets, like Earth. As it’s 2.8 billion miles from the sun, about 30 times as far as Earth, Neptune gets little sunlight. The average surface temperature is about –200 degrees Celsius. However, it has an internal source of heat, thought to be from radioactive minerals deep in the planet. At Neptune’s core, the temperature goes to 7,000 degrees Celsius. Neptune has the highest measured wind speeds in the solar system—up to 1,200 miles per hour. The large temperature difference between the internal heat source mentioned above and the coldness of space is believed to be driving the winds. A feature known as the Great Dark Spot was observed in Neptune’s southern hemisphere by the Voyager 2 probe. It was first thought to be like Jupiter’s Great Red Spot—a giant stable storm system. 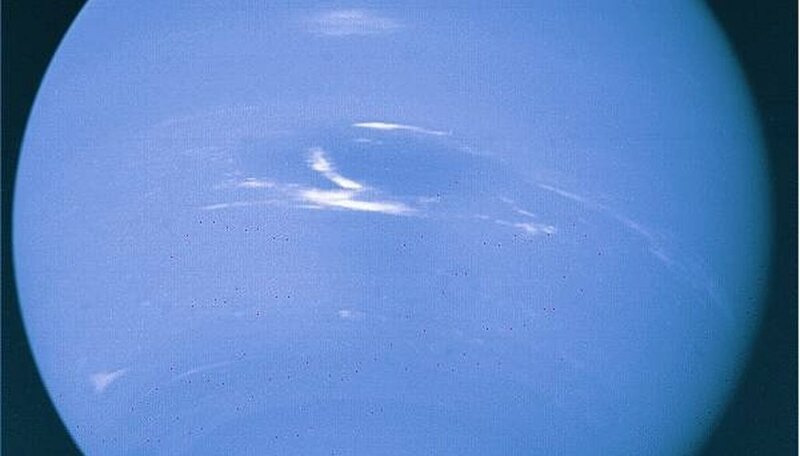 In 1994, however, Neptune’s spot vanished. A similar one appeared in the northern regions. This feature is now thought to be not a storm but a hole in the methane clouds. A white cloud system, also seen by Voyager 2, was nicknamed “Scooter.” It orbited the planet every 16 hours. Because of Neptune’s orbital period of 165 years, its seasons are 40 years long. It’s tilted on its axis about as much as the Earth is, so incoming sunlight changes for its different latitudes through its seasons. When the northern hemisphere is tilted towards the sun, heat builds up and releases methane gas into space. The same happens over the south pole during its sunny season. The planet’s thermosphere, a layer of thin gas high in the atmosphere bordering space, has been found to have a temperature of 380 degrees Celsius. Sunlight at Neptune’s distance is not enough to heat the atmosphere this much. Some theories have been offered, such as energy released by the solar wind’s movement against the planet’s magnetic field. It’s still unknown why this region is so hot. Papiewski, John. "What Is the Climate on Neptune?" Sciencing, https://sciencing.com/climate-neptune-5127481.html. 24 April 2017.